Indulge your rebellious side! 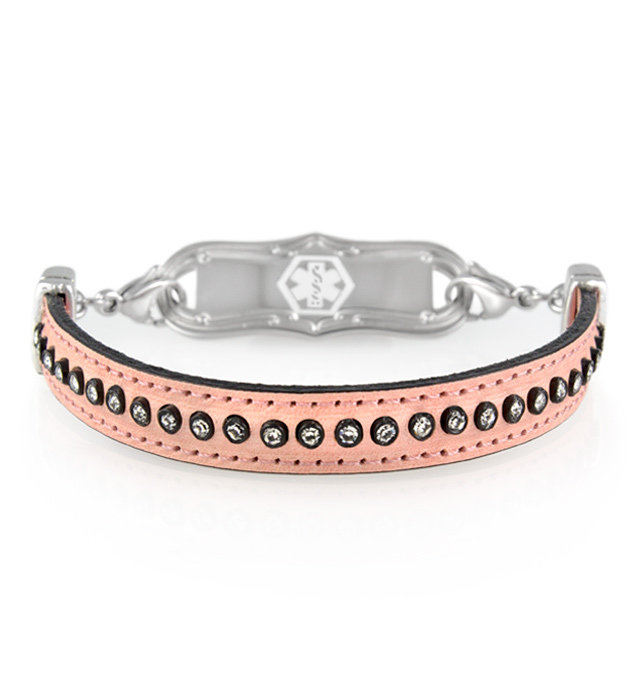 Sparkling crystal accents run the length of this salmon pink leather in an intentionally offset manner, giving just a little extra non-conformity to this edgy medical ID bracelet style. Perfect for everyday wear alone or stacked with your favorite fashion pieces, the Rebel Medical ID Bracelet pairs beautifully with your custom-engraved medical ID tag from Lauren’s Hope. As with all of our interchangeable designs, you can wear your Rebel Medical ID Bracelet with any custom-engraved Lauren’s Hope medical ID tag, keeping what’s truly most important to you right at hand. This on-trend med ID is a great choice whether you wear your medical alert bracelet for Type 1 Diabetes, epilepsy, heart conditions, food allergies (such as peanut, tree nut, soy, or wheat allergies) or for any other medical condition or treatment consideration. Custom engraving allows you to choose the look you want so you can stay safe in style.